Dinosaurs (Greek: δεινός, deinos + σαῦρος, sauros) are an extinct superorder of the class Reptilia, and known from recovered remains and tracks found in sedimentary rock worldwide. Dinosaurs were immensely varied, and included both herbivores and carnivores. Although many have been found in the fossil record, paleontologists expect that they have barely scratched the surface of the vast superorder that the dinosaurs encompassed. The superorder Dinosauria has been divided into two main orders, the division based exclusively on the structure of the pelvic bones. Saurischian dinosaurs are characterized by "lizard hips", i.e. the pubic bone of the pelvis juts forward towards the rib cage. Herbivorous species were almost all quadrupedal. They carried peg-like teeth which cut, rather than chewed, plant material, with the actual grinding of this food aided by gastroliths. Carnivorous species were exclusively bipedal. Species of this infraorder are characterized by long necks and tails, barrel-shaped bodies, and column-like legs. In three families (notably Diplodocidae, Brachiosauridae, and Titanosauroidea) several species were determined to be of extreme size, estimated in excess of 125 feet in length and 100 tons, making them the largest animals to have walked the earth. Exclusively bipedal; forearms meant for grasping or holding. Fossil evidence for several species indicate pack hunting. Ornithischian dinosaurs are characterized by "bird hips", i.e. the pubic bone of the pelvis juts towards the rear of the animal. All species were herbivorous; most were quadrupedal. Front teeth were lacking, while a predentary bone was present in the front of the lower jaw. Several species (mainly within Ceratopsia) had a distinctive parrot-like beak. Species of this infraorder carried one or more horns on their heads, as well as a shield-like frill to protect the neck. Large dinosaurs with a row of bony plates on top of their backs, and several spikes used as a defensive weapon at the end of their tails. Heavily-armored dinosaurs, some with a row of spikes along each side, and possessing a bony tail club. Large, herd-dwelling dinosaurs that could run bipedaly. Several species had a "boss" of bone on their heads (Pachycephalosaurs) which may have been used for head-butting similar to bighorn sheep; others a crest of bone (hadrosaurs) which may have been sound resonators. The first published description of a dinosaur occurred years before the word was created. In his Natural History of Oxford-shire Robert Plot, a professor of chemistry at the University of Oxford in 1676, described the lower end of a petrified femur which was too large to be from any known animal in Europe; the femur itself was lost, but the description as well as an accompanying engraving would lead others to determine later that it belonged to the theropod Megalosaurus. In 1824, the British scientist William Buckland published a paper titled "Notice on the Megalosaurus or great Fossil Lizard of Stonesfield", the first scientifically-described dinosaur; a second dinosaur (Iguanodon) would be similarly-described the following year by Gideon Mantell, with a third dinosaur (Hylaeosaurus) discovered in Brighton in 1832. Despite having reptilian characteristics, the size and structure of the remains justified the creation of a new biological category, and in 1842 Richard Owen coined the name "dinosaur" from two Greek words meaning "terrible lizard". The three dinosaurs were reconstructed and displayed at the Crystal Palace in London as part of the Exhibition of 1851. In 1878, several dozen Iguanodon fossils were discovered in the course of mining operations at a coal mine in Bernissart, Belgium. This find suggested that dinosaurs could travel in herds. Henry Fairfield Osborn was president of the American Museum of Natural History in New York City from 1908 to 1935. In July, 1806 Meriwether Lewis and William Clark unsuccessfully tried to retrieve "...the rib of a fish which was Semented within the face of the rock" at the Hell Creek formation, in what is now Yellowstone County, Montana; the ribs were later determined to have come from a terrestrial dinosaur. In 1858, Hadrosaurus, the so-called "duck-billed dinosaur", was found in a mineral pit in New Jersey. It was put on display at the Philadelphia Academy of Natural Sciences in 1868. In 1869, Edward Drinker Cope (1847-1897) had reconstructed a plesiosaur. Othniel Charles Marsh (1831-1899) was able to establish that Cope had put the skull on the wrong end of the skeleton, humiliating Cope, and beginning a long and bitter rivalry derisively-called the "Bone War". While previous skeletons had been discovered by accident, Cope and Marsh went on expeditions to arid parts of the American West. The two found numerous fossils in Wyoming, Colorado, and New Mexico as they competed to find and name as many species as they could. Their museums worked out the techniques for mounting and displaying them. The feud between Cope and Marsh reached a climax in 1890 when letters containing bitter recriminations were published in The New York Herald. Congress responded by dismissing Marsh and revoking funds for his entire department. In 1877, Marsh began digging at Como Bluff, Wyoming. This site proved to be the greatest of all paleontological finds. Many Late Jurassic dinosaurs, including Stegosaurus and Brontosaurus (later renamed Apatosaurus) were discovered here. J.B. Hatcher collected dozens of Late Cretaceous horned dinosaurs at Lance Creek in northeastern Wyoming in 1889–1894, including Triceratops. In 1905, Henry Fairfield Osborn applied the name Tyrannosaurus rex, meaning "“king of the tyrant lizards" to a fossil recently discovered at Hell Creek. This fearsome predator, perhaps 21 feet tall, would capture public imagination. In 1909–1923, 350 tons of dinosaur bones were removed from what is now Dinosaur National Monument in Colorado under the direction of paleontologist Earl Douglass of the Carnegie Museum in Pittsburgh, Pennsylvania. Creation science asserts that the biblical account, that dinosaurs were created on day six of creation approximately 6,000 years ago, along with other land animals, and therefore co-existed with humans, thus debunking the Theory of Evolution and the beliefs of evolutionary scientists about the age and creation of the earth. Creation science posits that dinosaurs lived in harmony with other animals, (probably including in the Garden of Eden) eating only plants; that pairs of each dinosaur kind were taken onto Noah's Ark during the Great Flood and were preserved from drowning; that many of the fossilized dinosaur bones originated during the mass killing of the Flood; and that possibly some descendants of those dinosaurs taken aboard the Ark are still around today. At least 300 distinct genera of dinosaur have been identified. Archaeological, fossil, and documentary evidence supports the logical conclusion that dinosaurs co-existed with mankind until at least relatively recent times. Because the term only came into use in the 19th century, the Bible does not use the word "dinosaur." However, there are numerous references throughout the biblical account. For example, the behemoth in Job and the leviathan in Isaiah are clearly references to dinosaurs, although others have claimed that Behemoth and Leviathan are references to a hippopotamus or elephant and a crocodile respectively. However, the Biblical descriptions do not fit those creatures, note that hippopotamuses and elephants do not have a "tail like a cedar". Furthermore, even if the terms did refer to other animals, this does not necessarily invalidate the existence of dinosaurs. The Creation account was not intended as a comprehensive list of all animals God created - it does not for instance state explicitly that He created the ferret. However, Genesis does state that God created all animals, which would include any not mentioned by name. Creation science rejects the great impact theory, and find a number of faults in that theory. Despite these critiques, the great impact theory is widely considered by the scientific community to be fact. However, those scientists cannot prove the great impact theory definitively. Creation scientists point out that evolutionists are frequently coming out with new theories to explain the supposed extinction of the dinosaurs, and that those theories are laden with false assumptions. Creation science cites a number of reasons to believe that dinosaurs have existed until relatively recent times, and perhaps still survive. There have been a number of sightings of dinosaur-like creatures reported by the best of the public. A thousand people reported seeing a dinosaur-like monster in two sightings around Sayram Lake in Xinjiang according to the Chinese publication, China Today. Locals in the Congo have reported a creature they name Mokele-mbembe, and from its description it appears to be a small plant-eating dinosaur. The reports have been taken seriously enough that a biologist from the University of Chicago has made several expeditions to find the creature. Another biologist has reported seeing the creature. Dinosaur-like creatures have been seen by several people in two different parts of Papua New Guinea since 1990. There are drawings of creatures resembling dinosaurs. An expedition which included Charles W. Gilmore, Curator of Vertebrate Paleontology with the United States National Museum, examined an ancient pictograph which he claimed portrays dinosaurs and man coexisting. The Nile Mosaic of Palestrina, a second century BC piece of art, contains a portion which depicts a group of Ethiopians hunting what some claim appears to be a dinosaur; there is much debate on this, however, and most modern art historians consider the mysterious animal to be a lion or a crocodile (the latter theory is supported by the presence of the Greek word for "crocodile" written near the image of the mysterious animal). A portion of the Nile Mosaic of Palestrina, depicting the hunting of an animal which is often said to resemble a dinosaur (but which appears to be labelled "crocodile" in Greek). Engravings in the floor of Carlisle Cathedral appear to be of dinosaurs. They are on the tomb of bishop Richard Bell, who died in 1496. Creatures matching dinosaurs and similar creatures have been described by various people groups. Descriptions of dragons are widespread and match descriptions of dinosaurs, showing that dragons were real creatures and were actually very likely dinosaurs. The World Book Encyclopedia states that: "The dragons of legend are strangely like actual creatures that have lived in the past. They are much like the great reptiles [dinosaurs] which inhabited the earth long before man is supposed to have appeared on earth." Dragons exist in the folklore of many European and Asian cultures. World Book Encyclopedia says, "In Europe, dragons are traditionally portrayed as ferocious beasts that represent the evils fought by human beings. But in Asia, especially in China and Japan, the animals are generally considered friendly creatures that ensure good luck and wealth." Dragons appear in the flag of Wales, in traditional Chinese New Year's Day celebrations, and in the Chinese calendar. Every other creature on the calendar is a real creature. That dinosaurs are not known from the fossil record above the Cretaceous strata is not reason to believe that they have not survived until more recent times. Living specimens of orders of animals that were believed to have been extinct for millions of years have been found before, such as the Diatomyidae Squirrel, the Wollemi Pine  and the Coelacanth. The recent dinosaur tissue find is a strong rebuttal of the claim that dinosaurs lived millions of years ago. Creation science shows that the idea that birds are descendants of dinosaurs is not demonstrated by the evidence, and that the dinosaur-bird connection is even disputed by some evolutionists. Creation science also shows that the comparative anatomy analysis done by evolutionists comparing bird bones and dinosaur bones is flawed. The view of atheists, evolutionists, and others who accept the uniformitarian timescale is that dinosaurs existed on earth from 230 million years ago to 65 million years ago. In this view, the entire population of dinosaurs were wiped out by a mass extinction event (usually thought to be a meteorite) about 65 million years ago. This precludes humans and dinosaurs co-existing. Evolutionists speculate that a mass extinction of the dinosaurs removed a major food competitor, and predator, of smaller animals. As a result of a new "vacancy" in the food chain, following the K-T Event, it is theorized that vast speciation occurred, as the evolutionary pressure of a new cold age propelled animal species to adapt or die out. 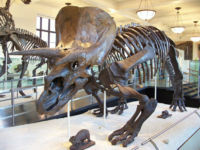 According to this view, mammals were some of the main beneficiaries of this explosion: their fur allowed them to adapt to the cold, and their small size allowed them to conserve energy relative to the huge dinosaurs of the previous age. As a number of feathered fossils (claimed to be dinosaurs) have been discovered, and evolutionary scientists claim the similarity in the bone structure between birds and dinosaurs show that modern birds are a descendants of dinosaurs. This is often cited as an example of macroevolution. Some evolutionary scientists assert that if human bones aren’t found with dinosaur bones, then dinosaurs and man didn’t live together. Creation scientists point out that this is a false assumption; if human bones aren’t found buried with dinosaur bones, it simply means they weren't buried together. Evolutionists speculate that radiometric dating of rocks containing dinosaur bones indicates them to have formed between 65 million years ago and 250 million years ago, whereas rocks with human bones in them are dated as being much newer (less than 5 million years old). Creation science shows that those methods of dating rocks provide false results, and therefore reject this argument. Creation science points out that the fossil record contains mainly marine organisms and that a small sliver of the fossil record contains vertebrates and thus shows that we shouldn't expect to find many human fossils at all. Moreover, as the biblical Flood would be a marine catastrophe, it would be expected that marine fossils would dominate the fossil record. This is in fact what we find. Approximately 70% of the Earth is covered in salt water which would also explain the dominance of marine fossils. In addition, creation scientists show there may have been a small pre-flood human population and that massive amounts of flood sediment are why we haven’t found human fossils in pre-biblical flood sediments. Also, creation scientists point out that we don't find human bones buried with coelacanths yet humans and coelacanths coexist today. Dinosaurs have been a fixture of popular culture since their discovery. It is theorized that some of the myths of fantastical creatures stem from the accidental discovery of dinosaur fossils. More recently, dinosaurs have featured in popular stories including books, movies, television, video games, even music. In the 1912 novel "The Lost World" by Sir Arthur Conan Doyle (of Sherlock Holmes fame), was published describing an expedition into an Amazon basin where animals thought to be extinct (including dinosaurs) had survived. Dinosaurs were introduced to a wide modern audience when movies like the Jurassic Park series were released. ↑ 9.0 9.1 9.2 9.3 Robert Doolan, Are dinosaurs alive today?, Creation, vol. 15 No. 4 p. 12. ↑ Allan K. Steel, Could Behemoth have been a dinosaur?, Journal of Creation vol. 15 No. 2 p. 42. ↑ Jonathan Sarfati, Did a meteor wipe out the dinosaurs?. ↑ Mokele-mbembe The Living Dinosaur! ↑ Anon., A living dinosaur?, Creation 23(1):56, December 2000. Irwin, Brian, Theropod and sauropod dinosaurs sighted in PNG? 1st July, 2008 (Creation Ministries International). ↑ See picture on page 241 of Batten, Don, et. al., 2007, The Creation Answers Book. ↑ Matthews, Michael, 99 and still fighting God, 8th December, 2003 (Answers in Genesis). ↑ Find the full quote on , starting from line 6. ↑ 44.0 44.1 44.2 44.3 Hodge, Bodie, If humans and dinosaurs lived together, why don’t we find human fossils with dinosaur fossils? Answers 1(1):52, May 2006. ↑ 47.0 47.1 Hodge, Bodie, Why Don’t We Find Human & Dinosaur Fossils Together? (chapter 13 of the New Answers Book), 2006. This page was last modified on 9 April 2019, at 02:18. This page has been accessed 452,163 times.